My condolences to the friends and family of Kevin Black, the cyclist killed in a terrible accident Friday in the Ballard neighborhood of Seattle. Kevin was a close friend of my extended family in Seattle -- we had a good conversation about comics on my last trip out there, and he seemed like a really nice guy. 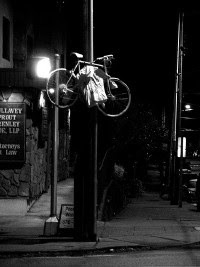 As an impromptu memorial, a bike and jersey mysteriously appeared on a lamppost near the accident the night it happened. He evidently touched many lives — again, my sympathies to everyone who knew him.